Quiltville's Quips & Snips!! : Show & Share with the Plano Girls! We had such a wonderful kick off to 2015 yesterday at Fabric Fanatics in Plano, Texas! This year I am teaching 5 different workshops, one of them being repeated on the 5th day for a 6 day quilting-streak before moving on to McKinney for another couple of days! Being together with these gals to kick off the New Year has become a Texas Tradition, and we've made room on the calendar for at least the next couple of years to keep it going. It’s like old home week! And every year we miss some who are not able to join us due to family obligations out of the area during the holidays on some years, and we welcome in some others who make the pilgrimage to come South or East or West ((Or North, if you are coming from Corpus Christi!)) to fill in the gaps and become part of our group! Yesterday we kicked off our Quiltapalooza with a Mystery! And so we can’t share the photos of our progress yesterday, or what the project was, not only because this class is being repeated on Saturday with a whole new group, and THEY want it to still be a mystery for them, but because this quilt is appearing in Quiltmaker Magazine in just a few months and it needs to stay under wraps until then. But be excited about some serious scrap stash busting when this one hits the news stands! You are going to love it! So instead, I thought you’d love to see the smiling faces of this crowd of 28 ladies! Hold those strips and cutters high! Just remember to close those blades! Meliza brought her little grasshopper! And Nell’s 1928 99k, traveling all the way through a Nebraska snow storm to get here! Add to this mix several featherweights and a 301 and our vintage machines were well represented! Look how hard they are concentrating! And yes, some of these ladies are nuts enough to take 4 or 5 classes with me this week! Oooh, it's going to be so fun! After lunch we broke for Show & Share, one of my favorite parts of the day. I get to see what everyone has been busy with over the past year since last year’s workshops! There are so many that I am going to post these in a slide show. Take a close look at Allison’s antique tops she brought to share…WONDERFUL!! Today! Day 2! Weed Whacker is up on deck! It’s going to be a very low key fun and scrappy day today, and we will fill it full. Not familiar with Weed Whacker? You can find it under the free patterns tab at the top of the blog! Check it out! New Year’s Eve. Wow! It came so fast! Whatever you get up to, wherever you are, I’m wishing you warmth, peace, happiness and safety! 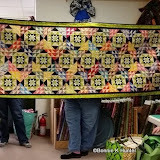 I like the quilt in the first photo of your blog for today; it is hanging on the whiteboard in the classroom at Fabric Fanatics. Is it your pattern or someone else's? If someone else's, do you know the name. It would be really great in just reds and greens for Christmas next year. Enjoy the gals there in Texas. I'm sure they'll enjoy having you there for so long. Happy New Year Bonnie! I hope 2015 is a wonderful year for you and all the Quiltvillians! Great quilts! So inspiring to see. Happy New Year to everyone. Thanks for sharing! Fabric Fanatics is an AWESOME shop! Wow! What a wonderful quilt show. That Grasshopper looks like it has a pretty big throat. Can someone measure it and report back? When I heard the name Weed Whacker I was reminded of a Quilt Show in Bozeman MT years ago where a gentleman demonstrated his method for fraying rag quilts by laying them on the lawn and going over them with an actual weed whacker!!! It worked too!! !